They are items listed by you on an online sales channel. 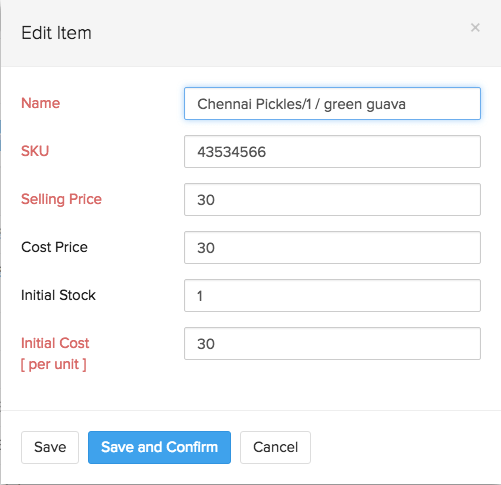 a live Zoho Inventory account. an account or a store on an online sales channel. 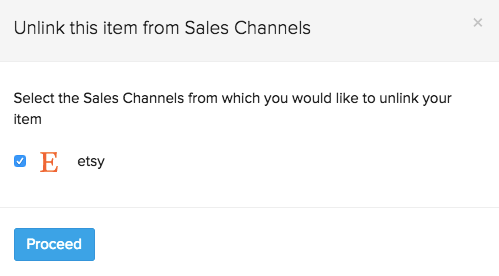 During a sales channel integration, if the SKU or the Name of an existing item in Zoho Inventory matches with a sales channel item, then system will automatically map & sync the incoming sales channel item to it. When the automatic mapping is not possible or if the sales channel item does not exist in Zoho Inventory then, the items being imported from an online sales channel are obtained as Unconfirmed Items. Important! These items cannot be associated to transactions and their associated online orders will be frozen until they have been mapped manually to Zoho Inventory. On the Dashboard under the Product Details section. Under a dedicated Unconfirmed Items filter inside the Items module. From the Records Synced section of the sales channel Sync History inside the Integrations module. Additionally if there online orders for these unconfirmed items, they can also be accessed and confirmed from within those online sales orders. You can import items from your online sales channel into Zoho Inventory and not the other way around. Integrate your Zoho Inventory with your online marketplace or shopping cart. Learn more about sales channel integrations. The initial item sync will be triggered after 30 minutes from the time of the integrating the two. Records Synced - Existing Zoho Inventory items and sales channel items that have the same SKU values will be mapped to each other by default. 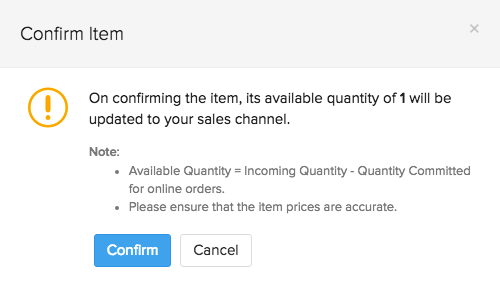 All the other sales channel items(both new and unmapped items) will be brought in as unconfirmed items which can be manually mapped by you. Failures - All the items that fail to sync from your sales channel to Zoho Inventory for one or more reasons will not be brought into Zoho Inventory. (you can obtain the cause of such failures from the Failures section of the Item Sync history) However, rectifying the failures and updating the sales channel item will allow the system to reimport it during the next sync. Method 1 - Update & confirm unconfirmed items - This method is recommended when there is a need for updating the details of your unconfirmed items before adding them to Zoho Inventory as new items. This method can be used to update your offline selling price, purchase price & opening stock values, etc. for your items before confirming them. Method 2 - Confirm unconfirmed items directly - This method is recommended when the user is confident of the item data and wishes to instantly add these items to the inventory. Method 3 - Linking a sales channel item to an existing item - This method is recommended when the SKU value of an existing item in Zoho Inventory is different from the SKU value of the same item in the sales channel. This method is also recommended for integrating with sales channels like Etsy, which do not support SKUs for its items. Navigate to the preferred unconfirmed item. You will be redirected to an item edit window where you can edit the item information. Note: Please pay special attention the following fields - purchase price, selling price & opening stock value before confirming the item. Sales channel items do not have purchase information and hence the system will by default equate its selling price to its purchase price & opening stock value. Hence it would be wise to update the actual values of your item purchase price & opening stock value during the update process. To finish, click on the Save & Confirm button to add the item to your inventory right away. Click on the Confirm button to instantly approve and add this item to your inventory. 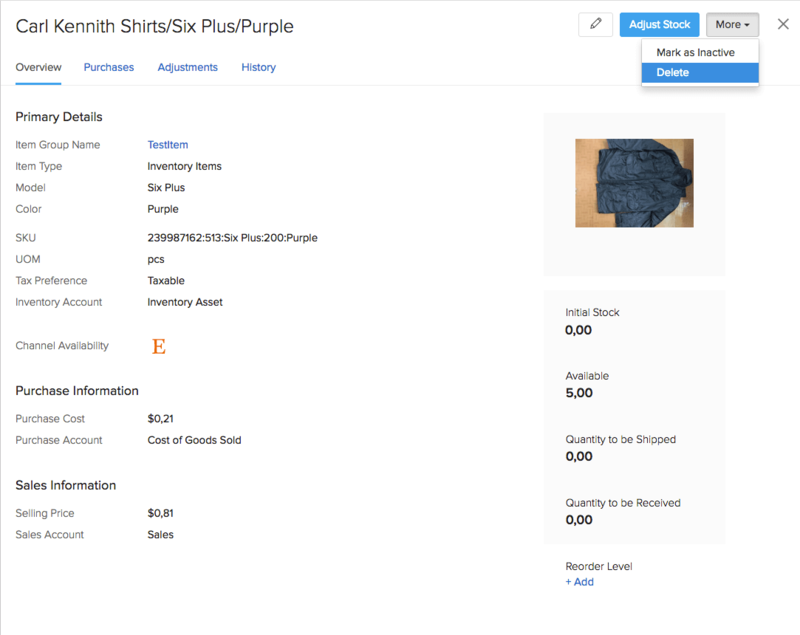 This will trigger a confirmation pop-up displaying the item name, SKU and the Available quantity. On confirmation, this item will be added as a new item to your inventory. Additionally you can also select multiple items and bulk confirm them by clicking on the Confirm Selected Items button from the top of either the Unconfirmed Items view in the Items module or from the Records Synced section of the sales channel Sync History under the Integrations module. Click on the Link to existing item button. 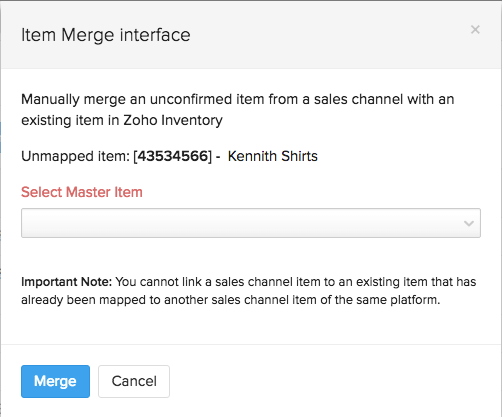 This will trigger an item merge interface, where you can select an item from Zoho Inventory and map it to the sales channel item. Click on the Merge button to finish. Unconfirmed items cannot be associated to transactions and their associated online orders will be frozen until they have been mapped manually to Zoho Inventory. Navigate to the Sales Orders module using the sidebar. 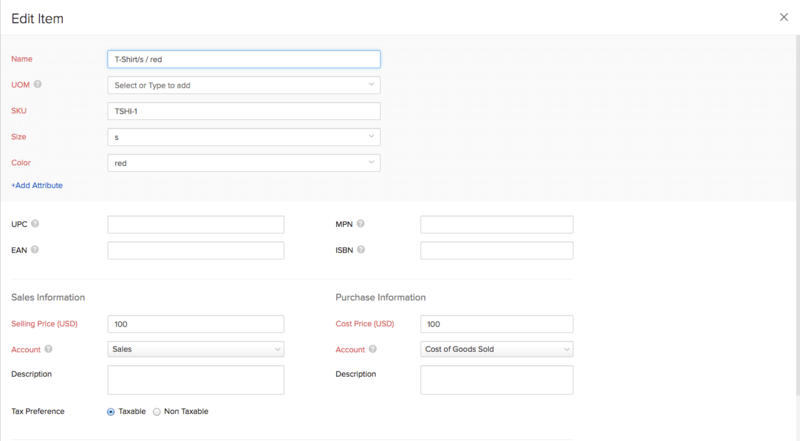 Apply the Marketplace filter for your sales orders. If the online sales order has one or more unconfirmed items, you will find a warning message indicating the presence of unconfirmed line items along with options : Confirm and Link to existing item. You can either select & confirm all the unconfirmed line items or link them to existing inventory items one by one. On confirming/mapping all the items on a particular online sales order, this order will be unfrozen and you can start processing the order by creating invoices, packages & shipments for it. Changes in stock level of the inventory item will no longer trigger a stock update to the sales channel item. 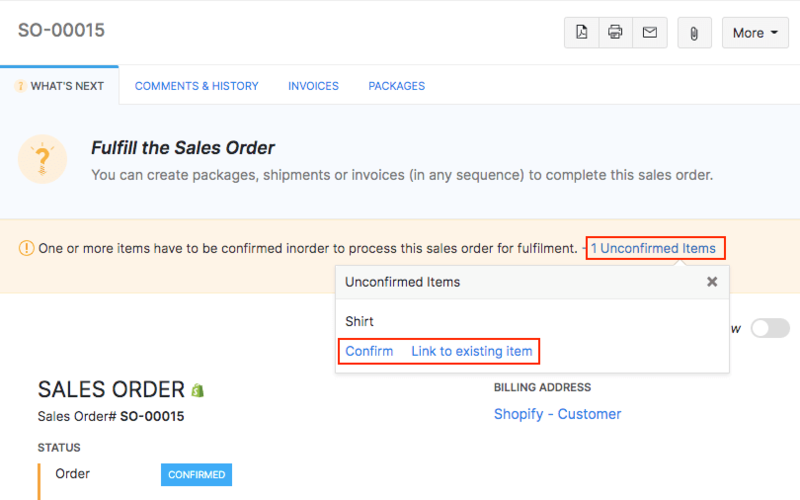 The sales orders associated with the sales channel item will not be synced with Zoho Inventory. Open an item that has been linked to sales channels. Click Unlink this item option on the item details page. Select the sales channels from which you would like to unlink this item. Tip: After unlinking, the sales channel item will be fetched as an unconfirmed item in the next sync. You can then freely link it to any other inventory item. This will help in cases where you have wrongly linked two items. 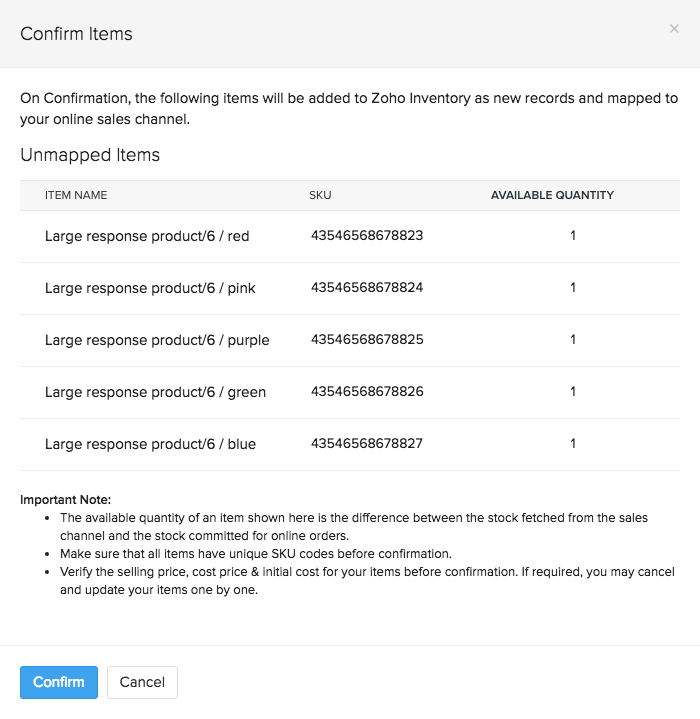 On integrating Zoho Inventory to online sales channels, the item stock levels from Zoho Inventory will be automatically updated to all integrated sales channels. This happens whenever a change in item stock levels are triggered by the creation of purchase receives, shipments and sent invoices for your inventory items in Zoho Inventory. Additionally, a sync will be established between Zoho Inventory and all of its integrated sales channels once every 4 hours. You can also establish a manual sync at any point of time. During the sync, new online orders(if any) will be imported from the sales channel and the quantity required to fulfill these orders will be recorded as committed stock in Zoho Inventory. Now the stock update to sales channel will be something like : Available Quantity = Current Stock Available in Zoho Inventory - Committed Stock(for the online orders fetched during that sync). Items that have been mapped with a sales channel can also be deleted like normal items. Very Important Note: You can delete an unwanted item or item group in Zoho Inventory. But please note that before you delete an item, you have to ensure that it has no transactions associated to it. If there are some transactions, then you have to delete them before you delete an item. Opening stock and stock adjustments are also considered as transactions. Click on the preferred Item group. Select the item you wish to delete. Apply the appropriate filter to narrow down your item. This can be done by clicking the filter tab on the left-top corner. By default the Active Items filter will be applied. Select the item to be deleted. Click on the More button on the top of the page. Select the Delete option from the drop-down. This is followed by a confirmation pop-up. Click on the Delete button to permanently delete it.